A WordPress site, like any other web site is susceptible to hacking, a virus infection, or just a plain technical glitch that in a matter of seconds can erase hours or months of work. 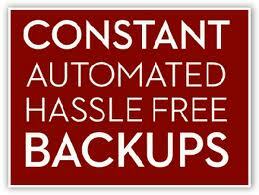 Backup, Backup, Backup is something that everyone is reminded to do but seldom does on a regular basis. Traditional thinking says to backup your site once per day. In some cases the Site Hosting Company may do this for you. If the site is an active one with visitors posting comments or articles and media being added throughout the day, can you really afford to potentially lose the last 24 hours worth of content? The VaultPress plugin is a realtime, continuous backup solution that will grab a copy of every post, comment, media file, revision and dashboard setting, every time a change is made to your site. The Basic VaultPress plan, starting at just $15 per month includes: Realtime Backup, Automated Site Restore (for just files or the Database), Archiving of your site at a point in time, Statistical Information, a Backup Activity Log, Full Site Disaster Recovery (for when things go very bad) and Concierge Support Assistance to help you get started or in case of crisis. There is an Enterprise VaultPress plan at $350 a month that might be appropriate for very large and very active sites that have thousands of visitors daily and requires a rapid response and recovery time in case of a site failure. The greatest thing about VaultPress is that it will backup a WordPress site of any size and can be installed and configured in about five minutes. Download and install the VaultPress plugin, add in the license key and that’s it. Within minutes VaultPress starts to backup the site. And every time any change is made, VaultPress initiates a process to backup that change. I use it for JasonPalmer.com and it is the easiest and most seamless backup solution I have ever deployed. What are Online Cloud and Offsite Backup Services?